Steve Jobs meets with President Obama - Photo | BlackBerry Blast! 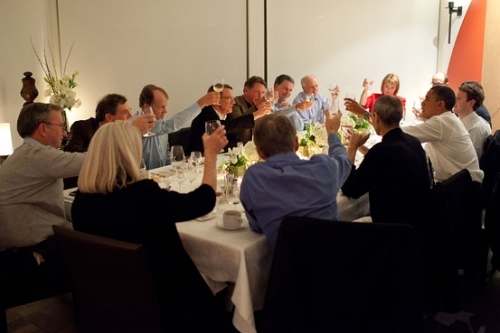 President Obama met with Apple's Steve Jobs, Facebook's Mark Zukerberg, Google's Eric Schmidt, and other tech CEOs at the home of venture capitalist John Doerr, just outside San Francisco. Mr. Obama wanted to discuss how government and the private sector could work together to get the economy going again. "The president specifically discussed his proposals to invest in research and development and expand incentives for companies to grow and hire," said White House Press Secretary Jay Carney to reporters traveling with the president. When we heard that Steve Jobs would be there, we were of course interested to see if a photo would be released that could give any indication about the state of his health. Well, here is the official White House photo but you can't tell much can you? There he is next to Obama with his usual black mock turtleneck on, but that's about all we can see in the photo. Hopefully, Steve is on the mend and on his way back to Apple!